Luis Vizcardo, Program Coordinator at Renaissance Entrepreneurship Center, was the featured speaker at SASS’s fall orientation sessions. Close to 70 English language learners who have transitioned—or are about to transition—from Sequoia District Adult School to the Cañada College campus attended a fall orientation session at the Adult School where they met fellow classmates, learned about Cañada College resources and brainstormed solutions to meeting some of the common challenges they face as college students. The featured speaker at this year’s sessions was Luis Vizcardo, Program Coordinator at Renaissance Entrepreneurship Center. 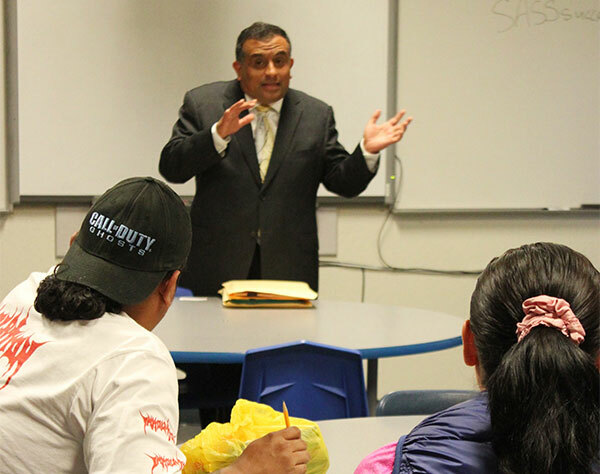 Vizcardo spoke to students about the benefits of using the skills gained in college to start a business, a subject of particular interest to immigrants who have a time-honored tradition of starting businesses in their communities. The orientation sessions are offered in conjunction with Project LEAP (Leadership, Employment and Academic Preparation), a program supported by the Silicon Valley Community Foundation whose purpose is to prepare English language learners to successfully transition from Sequoia District Adult School to community college. All of the attendees at the sessions received scholarships from Sequoia Adult School Scholars, a non-profit that pays for students’ textbooks and transportation to community college.